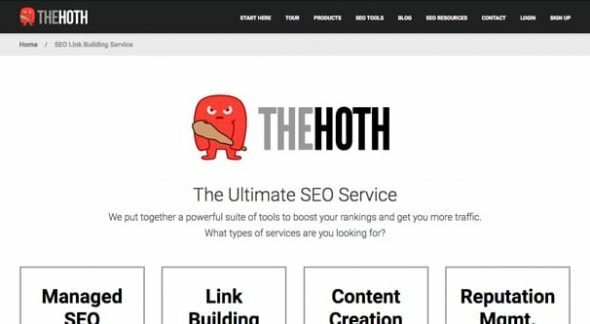 Blog > Resources > The Hoth Review: How Effective Is Their Link Building Service? I have mentioned The Hoth before on this blog, though only in passing. Since then, I’ve received a few requests for a review, with some others asking my opinion on their services more in general. I decided to give them a more solid look and see what I think. The Hoth bills itself as a white label SEO service. They create links from white hat guest posts on a variety of websites with which they have well-positioned writers. Though they appear to gate information on their site behind an email opt-in, you can get around it in a few ways to see what they have on offer. Here are their four main service types. Managed SEO. 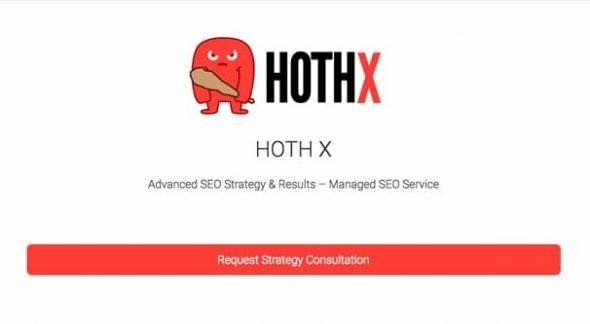 The managed SEO package HOTH X is a fully managed service to generate traffic. You hand your site over to the Hoth, and they embark on a campaign of link building to grow your site’s traffic and customer base. 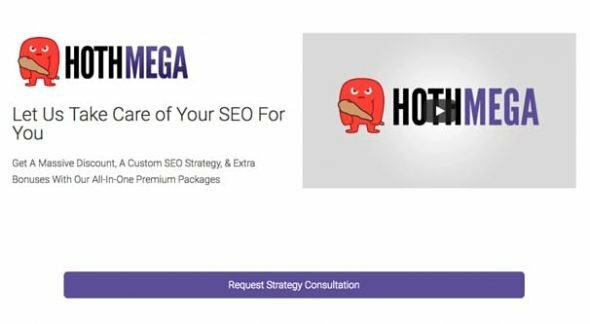 The higher-tier HOTH MEGA is even more comprehensive and includes keyword research, meta data optimization, outbound marketing and link building. You get blogging services, a portfolio of tools, homepage links from a variety of high profile sites, and guest posting outreach services. Link Building. All Hoth link building is done via guest posting, not through gray or black hat techniques like forum links or blog comments. 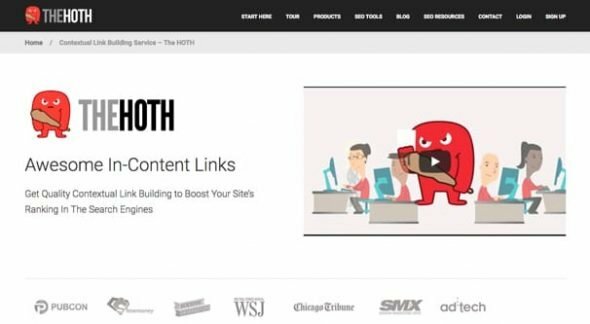 Link building packages include HOTH, HOTH GP, HOTH Local, HOTH Blitz, and HOTH Boost. I’ll cover those below. Content Creation. The Hoth has a staff of high quality writers that can create excellent content for your blog and for guest posts in your name. They can also create media of various types. Services in this category include HOTH Blogger, HOTH Video, and HOTH OnPage, which includes your on-site meta optimizations. Reputation Management. 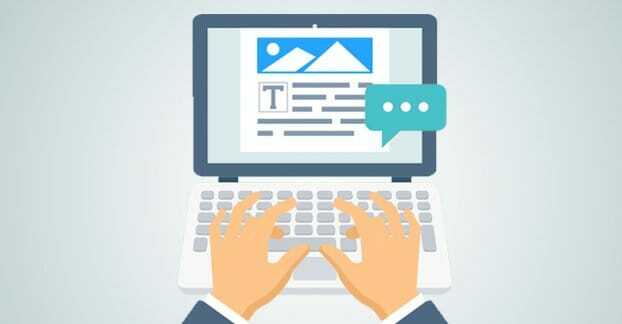 Reputation involves elements of the press and of online review aggregators, which The Hoth can help boost for you. This includes HOTH Stars, HOTH Press, and HOTH LMB, a simple service that secures your brand name across a wide variety of sites and social networks. Additional services. The HOTH includes a Rank Tracker and a Credits system where you can purchase credits for their services with surplus budget, which you can spend at your leisure. Reselling. The Hoth includes the ability to resell all of their services as an intermediary, if that’s your thing. It’s outside the scope of this blog post, however. The Hoth does not accept certain niches in their promotion. 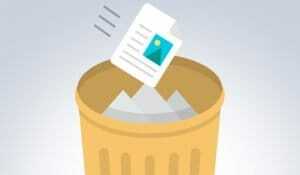 They will not work with sites in the adult, gambling, pharmaceutical, firearms, or in foreign language niches. They can do local SEO, though it’s not necessarily as refined as their normal packages. Pricing for the above packages varies quite a bit based on a bunch of factors. Suffice it to say that a lot of it is quite expensive, but at the same time comparable to the amount you would spend doing it all yourself, if you factor in your time as part of the cost. HOTH X has three packages starting at $1,000 per month. For this you get keyword research, gap analysis, link building and blog content, as well as boosting of your results. The other two packages are $2,500 and $5,000, with scaling options above that level. Each promises “<COST> worth of deliverables” which, I assume, assigns a value to each individual link and blog post and accumulates that amount of content per month. I don’t know what value they assign to each individual link or blog post. HOTH MEGA likewise has three packages, though they do not mention a scaling enterprise package. They also start at $1,000 and increase to $2,000 and $4,000. These are not monthly, but rather individual packages you can order. The $1,000 package can target 1-2 URLs and up to two properties. It includes two 1,000-word blog posts, their Mini+, five total guest posts, and a “blitz 5”, whatever that really means. The higher tier packages increase the number of possible targets and the number of guest posts you get. 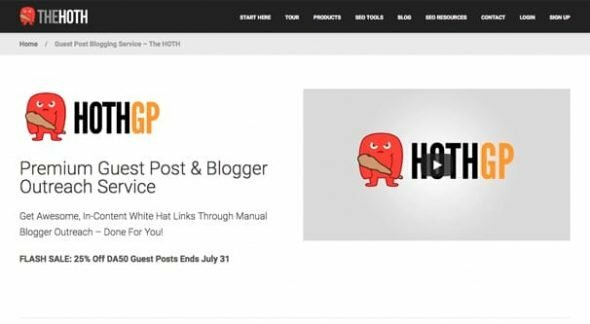 HOTH GP is a guest posting service that reaches out to high quality sites, both general interest sites and niche sites relevant to your brand. They earn you in-content links, not footer links, and they aren’t sponsored. 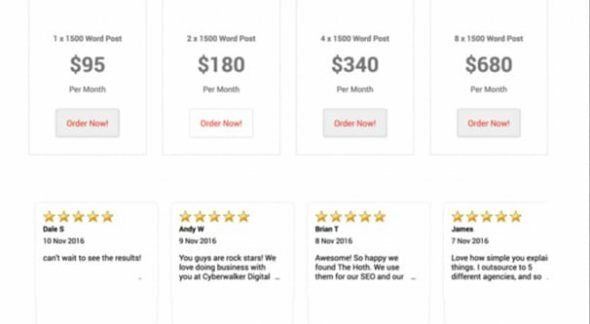 They have five different packages, starting at $100 for one article with one focused keyword and one URL on a site with a Domain Authority of 10+. For $150 you get one post with DA 20+. $200 gets you one post with DA 30+, and 40+ is $400 for a post. 50+ is $500 for a post. All packages have a five-pack you can purchase for a 10% discount, and a 10-pack you can purchase for a 12.5% discount. These are single ala-carte packages. The HOTH itself is their original service and is divided up into three packages. HOTH Mini is low competition keywords on three URLs, with one spun article, and several add-ons for higher volume sites, all for $60. HOTH Results is the same thing for more URLs and for five articles, for $200. HOTH Platinum is the same thing for 24 unique articles, not spun content, for $250. Premium versions of each package are further expenses. HOTH Local is their geo-targeted link building campaign format. They audit your local presence, add citations to local directories including rich media through sources like Flickr, and social media links. An audit itself is $49. Local link packages start at $149 for the audit and 30 links + five photos on three photo sharing sites. Additional packages with more links and additional content such as videos range from $199 to $549. 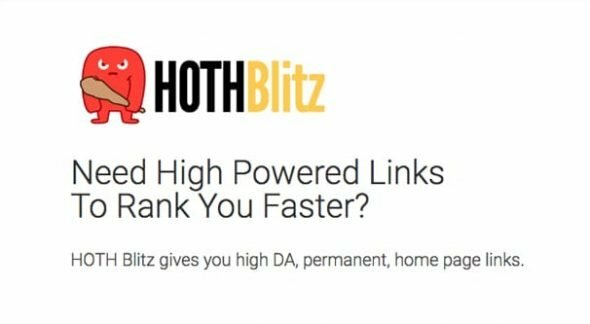 HOTH Blitz is a one-time link building push that gives you five links for $250, 10 links for $450, or 20 links for $875. All links are on currently available sites, rather than new sites created to power yours as with the Hoth itself. HOTH Boost is a series of small link sources, likely through comment links and other second-tier sources. You get 50 links for $49 or 250 links for $149, so compared to their other products, this is an add-on package. HOTH Blogger is a blog writing service. It’s a monthly service that creates 500-word articles with a single stock photo included with them. One post is $40, about what I’d expect for a middle-quality freelancer writing something similar. There are bulk discounts and higher prices for longer articles. 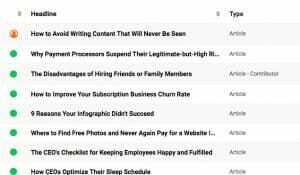 Eight 2,000-word articles will run you $960 per month, for example. 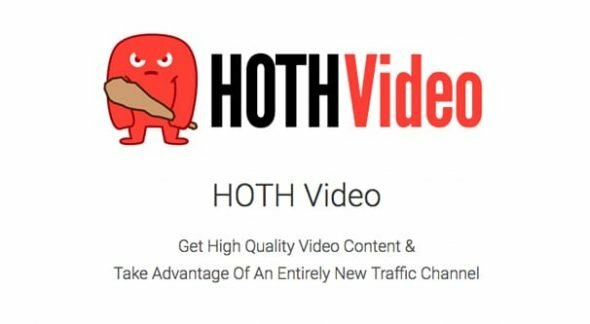 HOTH Video creates 2-4 minute videos, taking your topic and creating a script, filming it, editing it, and giving you an HD video. One video is $300, with discounts for buying eight at a time. HOTH OnPage is on-page optimization of your page title, meta descriptions, heads and subheads, and even URL optimization. It’s sold on a per-page basis, so larger sites will need to pay more to cover their entire blog. 2-4 URLs is $108 per page, scaling up to 20-30 pages at a time at a price of $93.50 per page. Given that most of this can be scanned and audited with free tools, I would avoid this package entirely. A blog with 100 posts would cost you nearly ten thousand dollars to audit this way, which is obscene. HOTH Stars is a customer review engine that claims to encourage users to review your products, but likely simply creates fake reviews. Reviews of one location will cost you $149 per month. 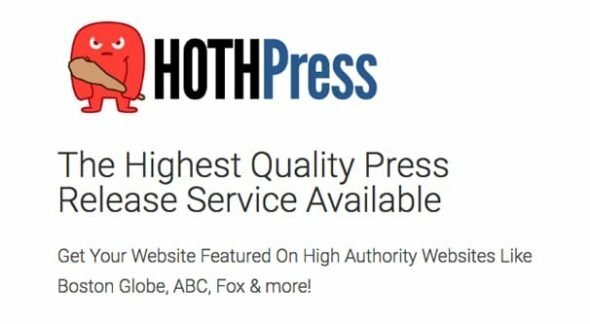 HOTH Press is a press release service. It only has one package, a single press release distributed to 100+ sites of varied quality, for $149. As far as press release marketing is concerned, this is fairly reasonable. HOTH LMB is a service that pre-registers your brand name account on as many sites as possible. It’s a simple service to prevent account squatting. They have different plans based on the number of sites they target, starting at $50 for 50 profiles registered. Given that only maybe 20-30 such sites really matter, higher tier plans probably aren’t useful. HOTH Rank Tracker is a keyword rank tracking tool. You can track 10 keywords for free, 100 keywords for $15, all the way up to 5,000 keywords for $375. Best used in conjunction with their keyword research, I suppose. You may have seen a few sketchy terms used in some of those product descriptions. 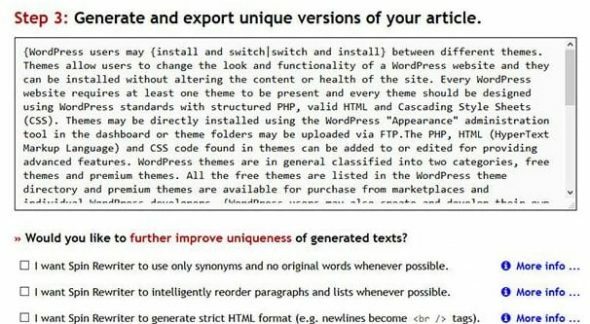 For example, paying for lower-tier content in some packages gets you spun content, not unique writing. Other link building options don’t reach out to existing sites, but rather create and build microsites aimed at tiered link building. Both of these are black hat techniques. Spun content is essentially plagiarism with a pretty face. You take existing content and change up some words to make it look like your own. This stuff was easy to detect in high school and it’s easy to detect now. Some very advanced spinning can pass muster, but it’s relatively rare and is essentially the same amount of effort as writing unique content. Tiered link building involves building sites that link to your site, and then focusing link building efforts on growing THOSE sites. This insulates your money site against link penalties. It’s also very transparent; Google knows when it’s happening and often penalizes entire blog networks for participating. It’s hugely risky, because it can backfire stupendously. At best, all of those links have a limited shelf life, and at worst they can become actively detrimental through link penalties. This puts the Hoth in a sketchy light for me. Some of their services are obviously black hat. Some of them are legitimate, but overpriced, like their on-site SEO auditing. Some of them are perfectly fine, like their higher end blog production. It’s really up to you to determine what your budget is, and if you’re willing to risk paying for potentially detrimental services. Is The Hoth Worth the Money? The question is, is the Hoth worth paying for? I would say in general, probably not. The best services, with high quality original content published on high profile domains, is probably just fine and useful. The problem is, most of their packages and services are distinctly not what I just mentioned. Some of the Hoth services are potentially very dangerous to use. Any time you’re embarking on tiered link building or paying for links through spun content, those links can disappear at any time. The Hoth has a money-back guarantee, but I doubt it extends more than six months after the creation of links. After all, they’ll claim, the web changes all the time. Even people who review the Hoth as affiliates agree that it’s dangerous and unlikely to work. One purchased a Mini package and found no change in rankings from the few links built for their site. Others have seen links turn against them or disappear entirely. My verdict is about the same. Some small selection of the Hoth’s services, at the high end, are useful. They’re also extremely expensive for what they do. Other services are either too expensive for too little benefit, or are exploiting black hat techniques to grow your site in a temporary fashion. You can try them out for yourself, but start small so you can test and evaluate. There are other sources of link building available, and you should always be testing and evaluating to see which service performs best for your site. Can It Harm My Site to Accept a Guest Post Article? Hi GHarris! A quick Google search will bring up a number of examples on the first page, and we’ve reviewed many of these services on our blog. Always do your homework and read reviews to see which of these will be the best fit for you. Definitely start small to test out a service. We’ve seen people making the mistake of spending thousands on an order and they end up getting poor quality links; not necessarily on The Hoth, but on similar services that help you with blogger outreach. Some of these services are selling Fiverr-quality services for hundreds of dollars. Stick with larger more reputable companies if you want to play it safe. Good luck! Thanks for the detailed coverage of The Hoth. Just placed a test order, will report back to let you know how it went.